Moray Council Trading Standards officers have seized six ‘hoverboards’ from Moray retail stores. Officers suspect that the hoverboards, or self-balancing scooters, are unsafe. The swoop follows similar action by Trading Standards across the UK. More than 17,000 imported hoverboards have been examined at ports and airports, with over 15,000 (or 88%) being detained at the border because they are unsafe. Many of the items have been found to have plugs without fuses and defective cut-off switches that risk the device overheating or catching fire. Shops in Forres, Elgin and Buckie were visited by trading standards officers in a county-wide operation. In recent months these faults have caused extensive damage to people’s homes and Trading Standards officers across the UK – in conjunction with the Department for Business, Innovation and Skills and the Chartered Trading Standards Institute – are urging consumers to be vigilant this Christmas with these unsafe products. 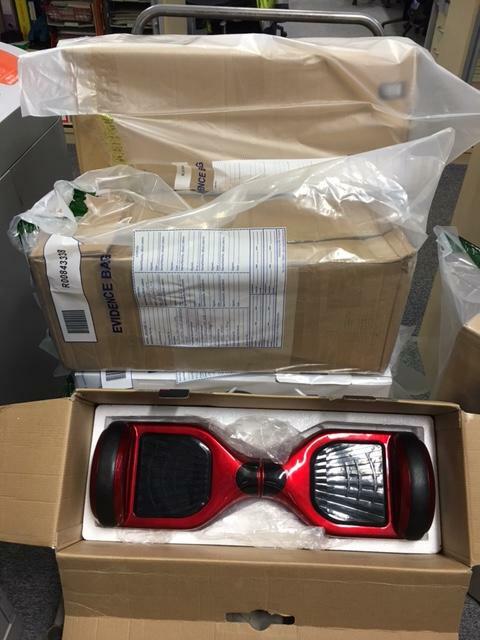 Officers at sea ports, postal hubs and airports have seen an increase in the number of unsafe ‘hoverboards’ arriving at national entry points in recent weeks and are working around-the-clock to prevent these and other dangerous items from entering the supply chain. “Criminals and irresponsible manufacturers will often exploit high demand and attempt to flood the market with cheap and dangerous products. “Consumers should not let a new fashion or craze cloud their judgement and remain vigilant at all times, to avoid taking home an unsafe product. “Some products that are made abroad, principally for the overseas market, are not fitted with the correct plug and fuse for use in the UK. Scottish Fire and Rescue Service Station Manager in Prevention and Protection at Elgin, Ben Law said: “The service is aware of the concern around devices being marketed as hoverboards or balance boards and our advice would be to never leave a charging battery unattended. Buying online for onward sale online? If you do this you are assuming the legal responsibilities of a business to ensure that what you’re selling complies with product safety and intellectual property legislation. For information about this visit https://www.gov.uk/starting-to-import.